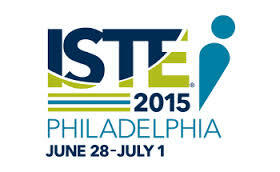 They (not sure who "they" are) say that your first ISTE is a conference like no other. Well, they weren't kidding! Nearly two full weeks after the closing key note and I'm still processing all that was my first ISTE - it was THAT overwhelming, exciting and transformational! Not unlike finishing a race that requires focus, endurance, and passion for what you are doing. I'm proud to say that I've conquered the BEAST that is ISTE! Rather than make this an exceptionally LONG post, I have decided to write my reflections slowly. That is to say, I will be "writing long" about each of the events that transpired over the course of the five days I spent in Philly at ISTE and the sixth that I spent at TCT. My plan is to write it like a race report, treating each event or milestone like a separate mile in what felt like a half marathon; after all, my first ISTE has me on a high not unlike the running high I was on after finishing my first 13.1 (I still remember that day with distinct clarity!). I was supposed to go to ISTE but my dad got sick so I missed it. I'm looking forward to your posts about it!